After installing SQL Server Express 2005 I was not able to connect to it using Visual Studio Server Explorer but I was able to connect to the database server using the SQL Server Management Studio Express. Visual Studio was giving me the following error. 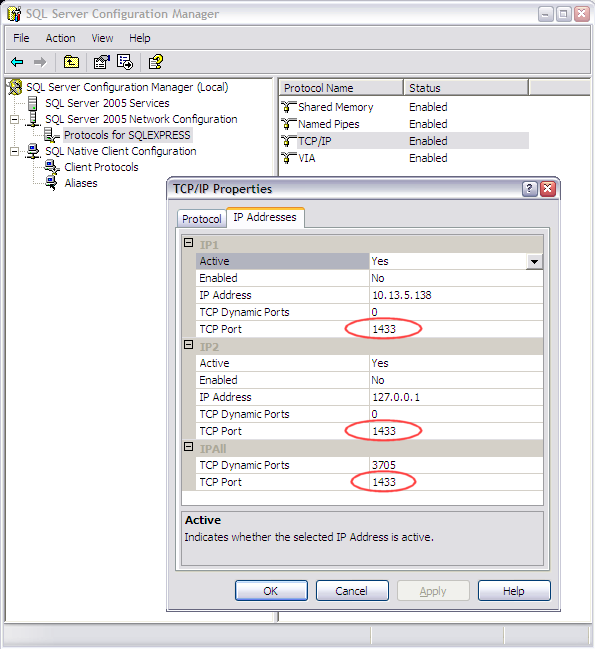 I had already used the SQL Server Surface Area Configuration to enable TCP/IP, the Management Studio to Enable both Windows and SQL Server Authentication modes and I had even enabled port 1433 on the windows firewall, but still I could not connect. I found that the port settings in the “TCP/IP Properties – IP Address” dialog of the “SQL Server Configuration Manager” were actually blank. I had to enter port 1433 manually into each of the “TCP Port” fields and after restarting the SQL Server service everything worked fine.